The utterly, untrustworthy attitude of the Central Bank of Sri Lanka appears to be seriously affecting the country’s entire financial system as it doesn’t keep to its promises given to depositors of the several failed financial institutions. 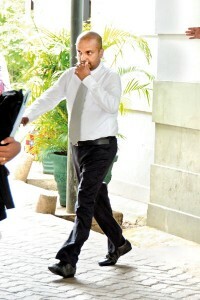 Deepthi Perera during a court appearance. These strong views were expressed during a media briefing called by depositors associations of the Industrial Finance Depositors’ Society Ltd (City Finance)-CFCL and the Central Investment and Finance Ltd (CIFL) two out of the three failed financial institutions which are to be axed or liquidated by the Central Bank (CB), held on Wednesday at the OPA auditorium in Colombo. It also emerged that due to this untrustworthiness of the CB confidence in this premier financial regulator by Sri Lankans and foreign investors has eroded and that may be one of the reasons to why foreign direct investments are not coming to this country. As no FDI is forthcoming the government has to borrow and the borrowings lead to bond issues which have led to major financial frauds and scams which too would be affecting the confidence of the foreign investors. Depositors of the two failed finance companies said that the CB meticulously adopts delaying tactics in solving the issues pertaining to the settlement of these failed finance companies which demoralise and paralyse the depositors as prolonged litigation cost lot of money and thereby the depositors are likely to abandon their fight for lack of funds. For the record, the CB has vigorously defended-now and in the past-against such allegations. In recent time under the present Governor Dr. Indrajit Coomaraswamy, the CB has said that investors brought by depositor associations to resuscitate these struggling institutions have not proved their credibility in bringing ‘clean’ funds into the country. The combined delegates pointed out that the CB appears to be least interested in restructuring these failed finance companies. Though outwardly it shows it pursues such a choice, inwardly there is no support as it has always been the attitude of the CB to liquidate the failed companies. Depositors indicated that all the fraudulent persons should be brought before the law and that they strongly believe that some CB officials are allegedly involved in these frauds and would have ignored the issues due to financial benefits in return. Dakshitha Bogollagama, majority shareholder of City Finance, said that the change of government tends to change even the major policies pertaining to the economy of the country and this also is a matter for concern in losing the confidence of the foreign investors. He said that all these depositors have lost interest and confidence in the CB and if the CB continues to fail by the depositors, they would not have any other option other than urging all the depositors in all the private financial institutions to pull out their funds with interest and deposit them in state-owned financial institutions where their deposits would be safe and secure. He said that the 2009 balance sheet of Industrial Finance Ltd now converted to City Finance revealed startling disparities such as huge increase in the trading stock of real estate. The consideration for depositor liability transfer is shown as a liability and there is no note in the balance sheet of this transfer while in 2010 the liability for the trading stock is increased by about Rs. 300 million while real estate asset value remained static. He told the media that from 2011 onwards the trading stock value reduced considerably and half the liability was transferred to shares while the audit report does not give an accurate detail as to the disparity and there is no detailed schedule for the trading stock. In 2009 the value has been inflated to match with the depositor liability because they could not pay the depositors who were issued shares the value to balance. He indicated that there are no notes to accounts and no explanations as to why these assets were written off and that the directors are responsible to take action against those who initially transferred these assets. File picture of a meeting of CIFL depositors. Speaking on investment in real estate, Mr. Bogollagama mentioned that funds collected from deposit holders have been spent on real estate projects carelessly and elaborating, he pointed out that the total investment made was Rs. 1,159,576,068 and for the period from 2009/10 to 2013/14, the total loss detected is Rs. 790,793,105. In addition to this loss, the opportunity cost incurred due to the investment made is more than Rs. 1.2 billion and Rs. 1,102,834,638 collected from deposit holders has been spent on real estate projects carelessly which has been approved by the CB. He pointed out that though CFCL has kept high value of real estate in its books, a bank has taken over real estate in Ratmalana in lieu of defaulted loans and another in Mount Lavinia has been mortgaged. No valuations were obtained as of 31st March 2013 as required by the Sri Lanka Accounting Standards. CIFLDA President W Gunawardene explained to the media the entire gamut of frauds involved and how its former CEO Deepthi Perera alias Chulaka Gunawardene who was hiding in Cambodia came to Sri Lanka to face the trial of allegedly defrauding Rs. 800 million and is now released on bail.He said that the case was taken up on 18 occasions on a B report filed by the CID and has not yet gone to trial. He said that they had meetings with the CB on 14 occasions and they were somewhat cordial except the last one where while the delegates were unarmed for the first time there was tight security introduced to the meeting. The attitude of the Deputy Governor who was conducting the meeting appeared to be aggressive and threatened to stop the meeting if the CIFLDA people continued arguing with them. He said that they have felt that from the beginning the CB has fooled them considering that the first time when they went to the Appeal Court for relief the case was dismissed without hearing. When they appealed to the Supreme Court, the CB meticulously trapped them to withdraw the case in the Supreme Court with the promise that the CB would settle the depositors. He said that with time and years passing their members who are old and without funds to meet their medical expenses are dying in large numbers but they are determined to fight back hard to win the relief for their members. It is very clear that CB is determined to liquidate these failed finance companies and it is suspected that there may be some CB officials too who are involved in “deals”. First and foremost there should be an impartial investigation into the alleged deals involved by the CB officials. He indicated that there are no notes to accounts and no explanations as to why these assets were written off and the directors are responsible to take action on those who initially transferred these assets. He explained as to how the CB has fooled them from ‘left, right and centre’ firstly with plans to merge the failed finance companies with the banks and financial institutions that were running well which did not materialize. The CB has also informed the IMF and the World Bank about this proposed merger. Then they were asked to withdraw the Supreme Court case they have instituted against the CB and in return to settle the depositors; this too didn’t materialise. In an October 2016 media release, the CB indicated that the depositors’ capital as well as the interest would be settled with a Rs. 20 billion investment and to commence settlements effective from January 2017, which died off with no results, he indicated. While the CB utterly failed to keep to any of these promises, the banking regulator is now clamouring to liquidate these failed finance companies, he said. He said that they suspect that all the fraudulent activities committed by Deepthi Perera and the couple, Roscoe and Swarna Maloney who allegedly removed chunks of funds from CIFL would have happened with the knowledge of some of the CB officials. In fairness to the depositors the entire activities of the CB with regard to the failed finance companies must be probed to punish the guilty. “We are now uniting with the depositors of other failed finance companies to fight back to obtain relief,” he said and thanked the media for supporting their cause. He urged the media to be with them to rectify this callous injustice which has now become a fight between life and death as many of their members are dying.